What is the WORKDAY.INTL Function? The WORKDAY.INTL function is categorized under Date and Time functionsFunctionsList of the most important Excel functions for financial analysts. This cheat sheet covers 100s of functions that are critical to know as an Excel analyst. It is a robust modification of the WORKDAY function, as it works with customizable weekend parameters. WORKDAY.INTL will provide us with a date that is N working days in the future or in the past but allows us to determine dates that would be weekends. We can also use the function to add or subtract days from a given date. In financial analysisFinancial Analyst Job DescriptionSee a real Financial Analyst Job Description including all the skills, experience, and education required to be the successful candidate for the job. Perform financial forecasting, reporting, and operational metrics tracking, analyze financial data, create financial models, the WORKDAY.INTL function will be useful in calculating the number of workdays worked by employees, the due date of invoices, delivery time expected for an order, or a debtor aging schedule. The most important use is that we can customize weekends so we can use it across countries with different weekends. Start_date (required function) – It is a date that represents start date. Days (required function) – It is the number of workdays to be added to start_date. If we enter a positive value, it will give us a future date, while a negative value will yield a past date. “0000011” – Saturday and Sunday are weekends. “1000001” – Monday and Sunday are weekends. [holidays] (optional argument) – It specifies an array of dates that are not included as workdays. The list can either be a range of cells that contain the dates or an array constant of the serial numbers that represent the dates. The ordering of dates or serial values in holidays can be arbitrary. 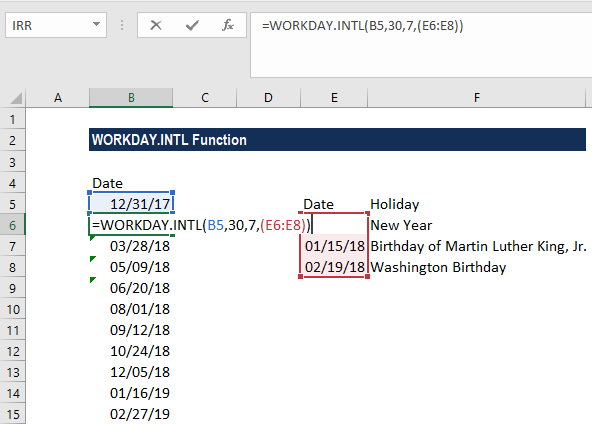 How to use the WORKDAY.INTL Function in Excel? Suppose we wish to add 30 days to a particular workday and subtract 20 days from a workday. The weekends here are Friday and Saturday. Here, we provided Holidays as the named range holidays (E6:E8), so holidays are taken into account as well. 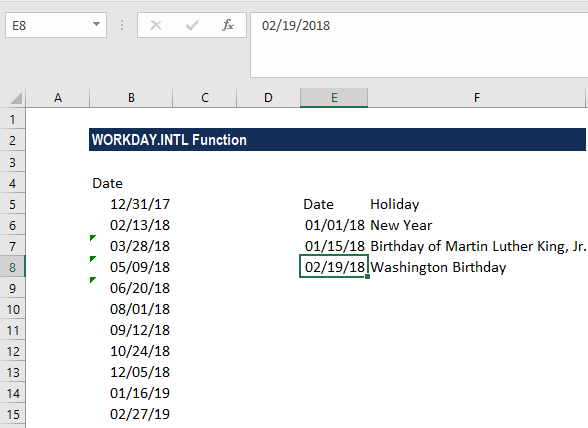 Excel is concerned only with dates and not with which holiday it is, that is, it is not concerned with the actual name of the holidays. The above formula tells us the first working day of the month from December 2017 to February 2019. The given weekend argument is invalid argument. If the days provided are not an integer, they will be truncated. The given [weekend] argument is an invalid text string.